Use honey to sweeten, dark cocoa powder and nut butters, that’s about it. Remember Reese’s? Same concept, only much more healthy! Use fresh ground nut butters, if you can. Certainly do not use any that have added sugars! The labels should read ground peanuts or ground almonds. Toast your own nuts, it’s easy and you are doing the process. Add dry milk powder or protein powder for added nutritional boost. I like to use maca powder for this. Using dry milk powder will also help them hold shape better when at room temperature. Extra virgin coconut oil please. Or grass-fed butter, but that’s a lot and it would be decadent but certainly not vegan. Before you begin, line a mini-muffin tin with pleated paper liners. It is important to use paper liners as you’ll need it to hold them while eating. Make two layers, chocolate first as it needs to firm up before adding the top layer. Using a double boiler, melt the coconut oil, honey and almond butter until smooth. Realize that it won’t be totally smooth due to the nuts you may choose to use. Rub the cocoa powder and maca powder through a mesh strainer to remove any lumps. Add a pinch of salt to the dry ingredients. Fold melted coconut oil mixture into the cocoa powder mixture, stir to totally incorporate; add vanilla and salt and stir well. 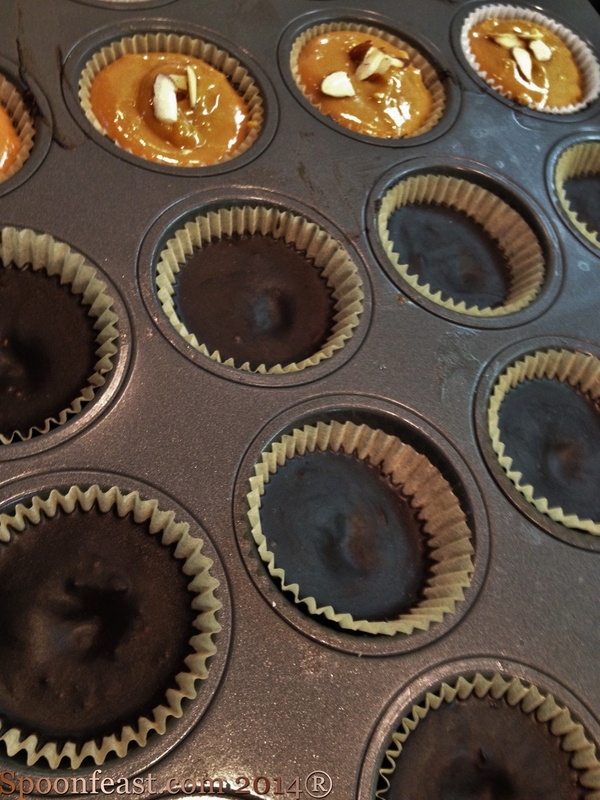 Fill each of the paper-lined muffin tins half way up with the chocolate mixture. Be careful not to dribble along the edges so the final product has a clean appearance. Work carefully. Once filled half way, pop the tray into the freezer to firm up while you make the next mixture. Melt everything over a double boiler until everything has melted. Depending on the texture you chose, it may be smooth or lumpy. Remove the chocolate cups from the freezer, fill each cup with the peanut butter mixture to the rim of the paper. 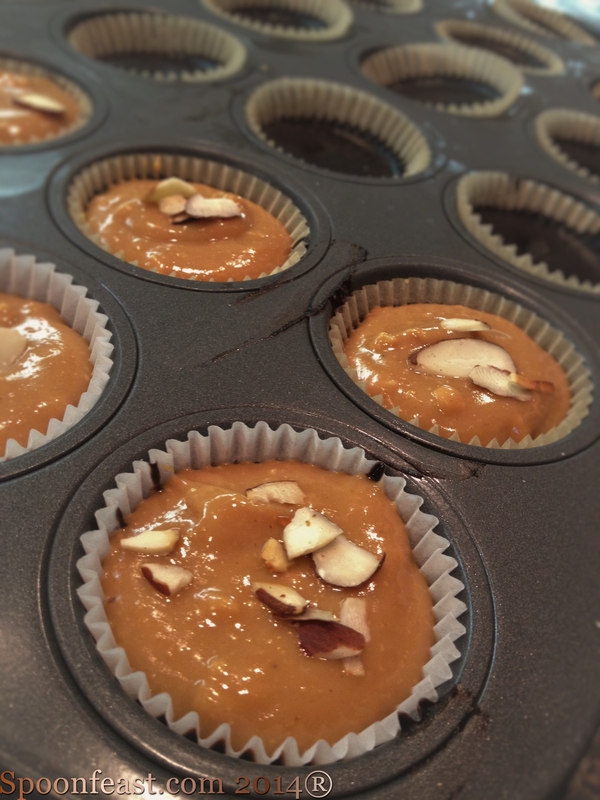 Sprinkle the top of each cup with toasted almonds and a piece of Maldon salt if desired. Freeze for a couple of hours before serving. These are best served frozen or extremely cold. if serving as finger food, leave the paper on, if plating a dessert with them, remove the paper. They will become rather soft as they remain in room temperature. If a firmer room temperature texture is desired, add 1/2 cup dry milk powder to each mixture. This will boost nutritional value as well. 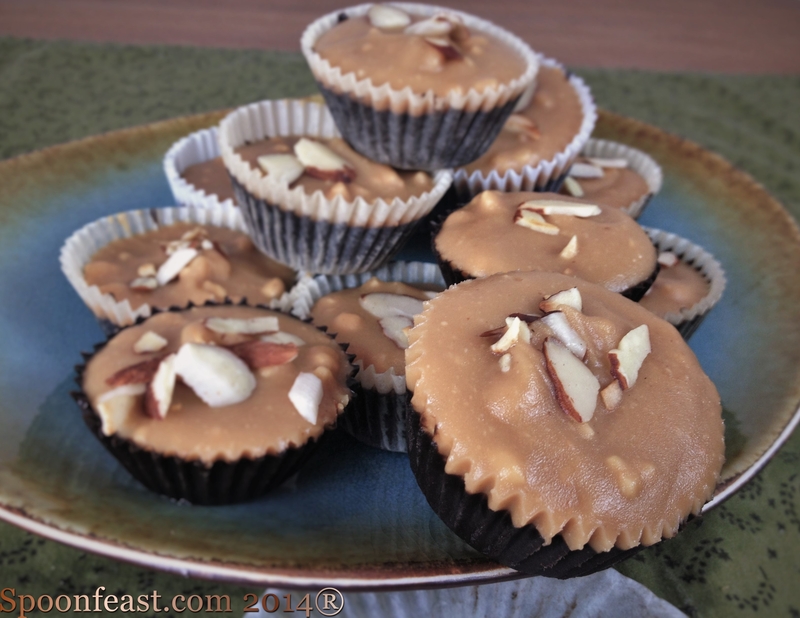 This entry was posted in Desserts, Eat Fresh!, Nutrition, Recipes, Snacks, Vegetarian and tagged chocolate, chocolate almond, chocolate almond peanut butter cups, healthy dessert, healthy treats, honey sweetened, maca powder, Peanut Butter, peanut butter cups, vegan, vegetarian. Bookmark the permalink. These look fantastic and easy to make. I have everything but the nut butter. Can you resist going to the store now? They are yummy! 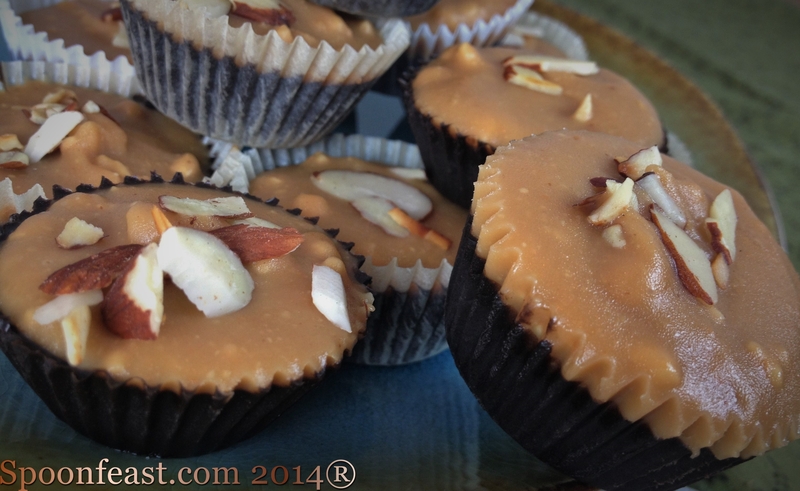 With halloween around the corner…these make a healthy option to serve at a party. The cocoa, if you use dark, comes out black, perfect for Halloween! There are plenty, take some and give them away! make sure you hide a few for you because they just disappear…fast!